The northern part of Jutland has been created during the last 10.000 years through land rising since the last ice age. The ground is very sandy and the landscape is flat, but many areas are covered with big sanddunes. In previous times the land was covered with woods and shrub but man has had a great influence on the landscape. Through clearing and burning of the woods, exhausting of the ground and overgrazing, the sand has been exposed. The strong winds in the area has then resulted in the creation of sanddunes. Hulsig Hede (Hulsig Heath) near the tip of Jutland is a large (c. 20 sq. km.) 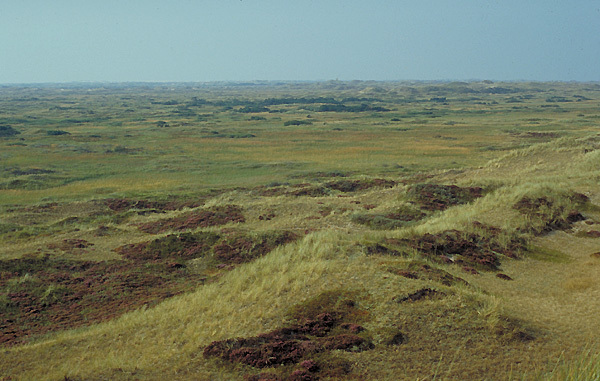 nature reserve with sanddunes and coastal heath. Some of the dunes reaches 25 m varying with wet depressions and plains with stones. The nature reserve is open for the public all around the year. The introduced Dwarf Mountain-pine (Pinus mugo) is a problem in the area. The pine was formerly planted in the big plantations established to slow down the sand drift. But this hardy tree thrive fine in the rough climate and has spread from the plantations out in the open. You can see a stand of Pinus mugo in the middle of the picture. The spread of the tree is now kept down through clearing and burning. On Hulsig Hede breed the rare birds Tawny Pipit (Anthus campestris) and Wood-Lark (Lullula arborea), and resting eagles and other raptors are often seen in the open areas. The vegetation is much alike the West Jutland heaths, but some plant species are particular caracteristic in this coastal heath terrain. Back to Bent Vestergaard Petersens Homepage.